January 2017’s monthly gathering of the CreativeMornings/Chicago chapter was the second time improv was the central theme. 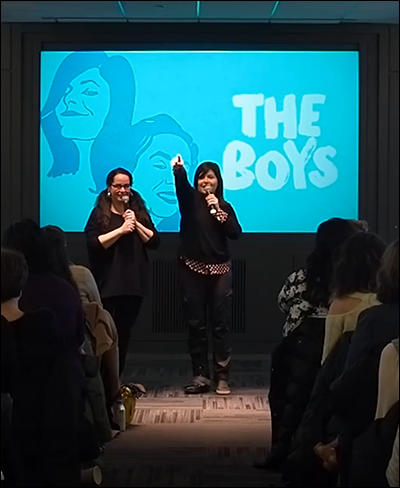 The talk by improvisational comedians Susan Messing and Rachael Mason, who comprise the duo The Boys at The Second City, advocated the power of improv as a tool for creative work. Susan and Rachel described the popular art form of improvisational theater as: “Listening to respond or listening to listen.” Artist Cheryl Pope, who spoke at February 2017’s CreativeMornings/Chicago gathering, claimed that “Listening is the most political act.” To The Boys, practicing improv is the act of conscious listening. Einstein believed, “Creativity is intelligence having fun.” This concept applies to improv that demands being collaboratively agile in the present—in “why not” mode and having fun in the process. Playing with ideas. Playing well with others. The creative worker’s affinity to improv is apparent. When anything is creatively possible, listening is thinking without quickly judging. Similar messages have been delivered on the monthly CreativeMornings/Chicago stage. In April 2015, sketch comedian Steve Waltien equated improv to “conscious humility” (read my write-up). In improv’s unplanned and unscripted situation, performers don’t conform to the ego of their own work or the script, but deftly steer their performance based on the input of both their group’s players and the audience. In our climate of “strategic patience,” Waltien’s emphasis on conscious humility can also be viewed as strategic humility, for improv excels when people come together—when everybody contributes, when everybody is present. Sound strategies (pun intended). With paying attention as a hallmark of creativity, I’m compelled to reiterate the conclusion to my write-up about artist Cheryl Pope’s CreativeMornings/Chicago chapter talk: Still listen. Big thanks: to AgencyEA, Green Sheep, Leo Burnett Department of Design (who also hosted), Lyft Chicago, for being Partners of Chicago CreativeMornings #61; to new organizer Jen Marquez who accepted the chapter’s hosting responsibilities from Knoed Creative who spoke at Chicago CreativeMornings #7; to the team of volunteers for greatly helping to have CreativeMornings happen monthly in Chicago.